Charles Darwin, author of the groundbreaking On the Origin of Species, is frequently quote-mined for a variety of reasons. Darwin continues with three more pages describing a sequence of plausible intermediate stages between eyelessness and human eyes, giving examples from existing organisms to show that the intermediates are viable. This process of gradual change has become known as Evolution. In a recent BBC documentary renowned British Evolutionary Biologist and secular author Richard Dawkins is interviewed about the evolution of the eye as investigated by Darwin in light of what we know today. The eye is often given as an example of something far too perfect and complex to have evolved from scratch. Eons ago animals had to bump into things to know what they were. Imagine the benefits if they could develop an awareness of food before actually stumbling upon it, or of predators lurking nearby. Evolution has fortunately given animals the perfect tool for this: the eye. An eye is very much like a camera. Light rays will come into the eye, be focused by the lens like the lens of a camera, then pass through the jelly of the eye to be focused onto the back of the eye, onto a structure known as the retina. The retina is lined by photoreceptor cells, which are similar to the film of a camera. These photoreceptor cells generate an electrical signal from the light energy. This electrical signal is then sent through the optic nerve to the brain, which translates the impulse into the image that we actually see. Despite this complexity, reason tells us that if there were a series of gradual improvements then it would have been easy for the eye to have evolved by means of natural selection. All over the animal kingdom we find eyes in various stages of evolution. We have examples of these intermediate stages of evolution in modern day animals. The first step is noticeable in the single-celled organism Euglena, of which over 1000 species have been identified. This organism just has a small eye spot at the end of the cell which is only sensitive to light, making it incapable of seeing anything or forming an image but which only allows it to tell whether it is light or dark, making this easily the first step in the evolution of the eye. If you were to imagine that you had a sheet of cells, each of which is sensitive to light, more cells would react to light. If this flat sheet were to evolve a slight curve to be turned into a shallow cup, light shining from one end would be registered on the opposite end of the cup because the light would hit the opposite side of the bent sheet of the cup. This makes it possible to determine from which direction the light is coming from and perhaps be able to tell the direction from which a predator’s shadow is passing over. 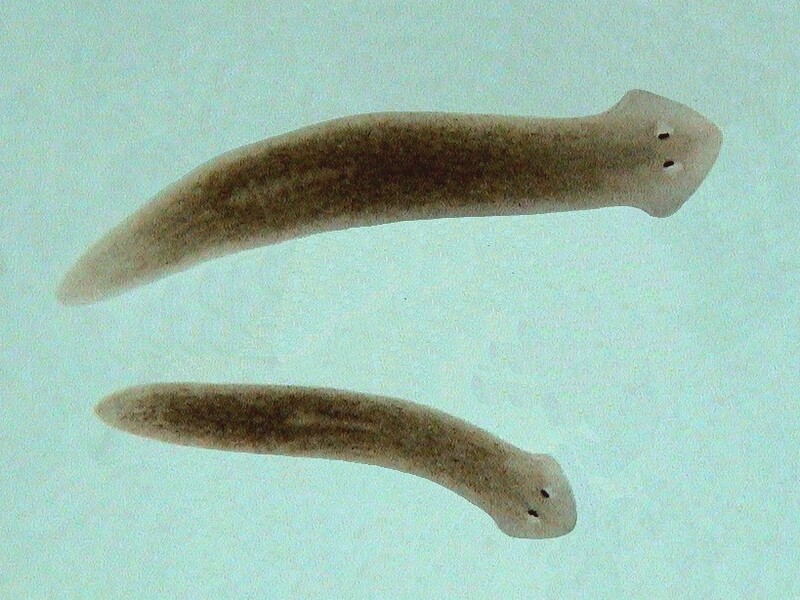 This means that the cup-eyes of Planarian worms, non-parasitic flatworms, for example, have a evolutionary advantage in the long run over animals with just a flat eye. So how do we progress from a cup-eye which is able to tell the direction light is coming from to an eye which is capable of forming an image? Over evolutionary time the cup becomes progressively deeper until the ends at the top eventually fuse shut leaving a small hole at the top. You then have a pinhole camera. The pinhole camera is a pretty poor piece of work because it doesn’t show you much of an image, but it does show you a crude image, making it possible to make out shapes and detect movement. In reality, a literal pinhole camera presents its viewers with a blurry, upside-down image, but an image nonetheless. A perfect example of this next stage in the evolution of the eye can be seen in many aquariums. 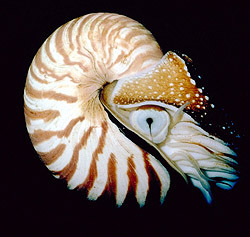 The mollusk nautilus, a relative of the extinct ammonite, has an eye on each side of its head that acts like a pinhole camera, which means they are capable of seeing blurry images. The solution to the problem of discerning detail in an image is the lens. A proper man-made lens is a curved sheet of glass capable of refracting light. In nature, and old bit of gunge that is transparent will serve this purpose so long as it is approximately curved. If you were to place some water into a small polythene bag it would naturally fall into a curved shape. Hold this in front of the space of a pinhole camera and the blurry image suddenly becomes considerably clearer. This water represents a blob of gunge in the cup eye. Eventually this gunge or jelly would harden to form a proper lens and transmit a brighter, clearer image. Sea snails have a blob of jelly that acts like a very simple lens, so they can focus on an object even if that image is still a bit blurry, but it does mean that they can make out food and predators. Once you’ve got that, and because it works a bit better than nothing at all, you’ve got the raw material for natural selection to go to work. Over each generation there will be a slight improvement in the curvature and a slight improvement in the transparency resulting in a steady ramp of improvement all the way up to a proper lens such as you get in the vertebrate eye. The eye is an astounding example of a complex structure that evolved fairly quickly and easily from simpler structures. What’s even more incredible is that as the eye evolved over millions of years, widely different species such as monkeys and molluscs, developed the same solutions to sight. This phenomenon is known as convergent evolution and examples of it are seen all over the world in a variety of forms, from the already mentioned eye to the fact that koala bears and humans have exactly the same fingerprints. 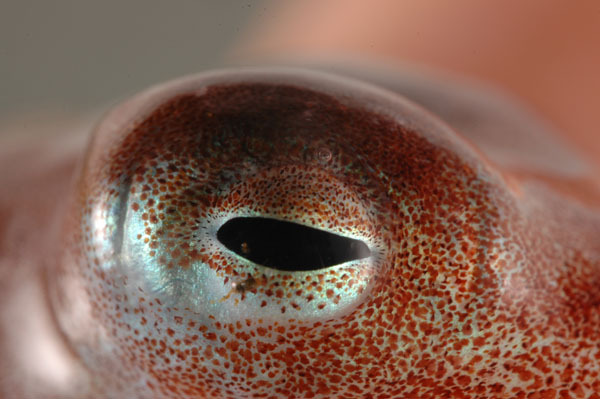 At the top of the mollusk evolutionary ladder is the octopus eye. It has a proper lens, it can adjust its own exposure and is pretty much like our own except that it comes from a completely different evolutionary line. Scientists have done a lot of modeling to determine how long it took to get from a flat eye to a vertebrate eye. They have concluded that it took approximately 400 000 generations to get from the simplest light sensitive cell all the way to a fully functioning eye as we know it. Given that this all started in simpler aquatic organisms with very short life-cycles, this process would have happened in less than half a million years, which is fairly quick in evolutionary terms. That is not the end of the story though. Another completely different type of eye has evolved as well: the compound eye. 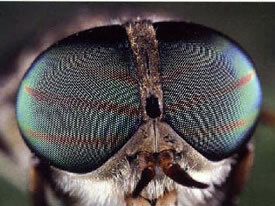 The compound eye is a type of eye commonly found in arthropods, including many insects and crustaceans. It has a meshlike appearance because it consists of hundreds of thousands of tiny lens-capped optical units called ommatidia. Each ommatidium has its own cornea, lens, and photoreceptor cells for distinguishing brightness and colour. They are separated from each other by varying degrees of pigment and all relay electrical impulses back to the optic nerve. With regards to the Argument from Design, the eye is an imperfect creation. The retina is back-to-front and it has a blindspot, amongst other things. P. Z. Myers discusses these arguments in more detail on his Pharyngula blog spot. Liz, a BBC presenter, takes a look at how the compound eye evolved and why it would not work for us. This video is unfortunately not available in South Africa. The development of the first transparent membrane to finalise as a cornea leaves the development of an accommodative lens – and only one such lens, accommodative or otherwise – unexplained. Has evidence of such ever been found or did evolution stop when it was onto a good thing ? The development of myopia in modern humans still has much explanation to come, and more to the point, its practicable inhibition. If this is an evolutionary change to adapt to new near visual demand then only the cessation of that demand would solve the myopia risk. As current humans that seems very unlikely. I would presume Myopia is a result of the fact that the human eye is not a “perfect design” in the first place, so it’s ability to see without any blur is unlikely to come about. Myopia would seem to have been always present as there is no one perfect copy of an eye in the first place. The diagnosis and correction of Myopia is a modern human activity but there is no eveidence that it wasn’t always present. It would be interesting to check the level of Myopia in other primates. I am no expert but I found Mr darwkins article on the eye rather uninformative. Just putting a few animals with different eyes together in a line does not explain or prove evolution. The article below is from answers in Genesis website. It explains that evolution does not explain where the new genetic information comes from to make different eyes. The second article reflects on amazing design seen in the eyes. As for the eye being wired backwards, the third article addresses that in part, from an eye specialist. Programmes like Bang goes the theory are great except when they give up observational science and believe in the faith science of evolution. We do not observe evolution from one kind of animal to another today. We can breed animals within certain bounds. We can see animals losing genetic information, such as fish that go blind because they live in pools without light. For evolution to be true across kinds of animals you need massive amounts of new genetic information across lots of different organs in an animal. But we have not observed amphibians becoming reptiles, and reptiles becoming mammals- massive changes that require huge amounts of genetic information. How absurd to think a land living mammal would go back into the sea and become a whale ! Apparently anything is possible if you mention millions of years. The fossil record does not give the millions of missing links necessary to prove evolution, even if you think that there were spurts of change. The fossil record shows that at one time the whole earth was covered with water, forming the enormous coal deposits from trees that we observe today, and chalk layers from sea creatures. (fossils don’t usually form today, so the present is not the key to the past- you need rapid burial to capture billions of creatures before they are scavanged- which is what happens today to dead animals). sounds more like a world wide flood to me. Strange how the historical record of the bible is observable. Go to the British museum and see the parts of the city of babylon- all mentioned in the Bible. What is even more incredible are the promises about a man dying a horrible death and being sold for 30 silver pieces (in the pslams ) which is all abut Jesus yet written hundreds of years before he was born. (there are many such prophecies). It is also true in my experience- when I was 19 I did not have any religion but read the Bible and it talked about God being love- i realized I did not love God because i did not love others and that there is a God who we should love. At that moment I had a spiritual new birth. No one forced me, no one changed me, no one was there. I was not a religious nut, but a very sceptical 19 year old. Yet my experience was ture and is also mentioned in the bible- those who turn from their sin and trust in Jesus Christ recieve a new birth , a new start with God. So Observable history, science, experience all line up for me, and God who does not lie has given us His word. He tells us how he made the world in six days by His Word. The God who I experience today revealed this to Moses. Darwin suggested, and his followers have complied, that if a graded series of organisms, each with some sort of eye, can be found then this would mean that the eyes could have been produced by natural selection. This turns out to be a very good trick. The reason that Darwin’s argument is a trick is because it really uses circular reasoning. Let’s say that such a graded series of organisms with increasingly complex eyes can be found in nature. One can only conclude that the eye was produced by natural selection if you start by assuming that all of the organisms share common ancestors. In other words, you must assume that evolution is true. Now, the fact is that such a graded series of organisms is found in nature from a single-celled euglena on up to a human eye. Setting up such a series does not explain how the human eye came to be. All it shows is that there are different organisms with different types of eyes in the world. Nonetheless, modern followers of Darwin still claim that all of this is evidence for evolution. Evolutionists often leave out the key ingredient necessary to account for an increase in complexity: information. For example, scientists had supposedly addressed a major criticism that creationists level against evolution—the absence of a genetic mechanism that would significantly alter the body plan of animals. The research of McGinnis and colleagues1 seemed to suggest that a mutation in a particular Hox gene was sufficient to suppress the development of legs. This mutation was believed to be responsible for the conversion of shrimp-like creatures with many legs into insect-like creatures with only six legs. However, this is really just a straw-man argument because creationists do not claim that mutations cannot alter the body plan. Rather, they claim that mutations do not lead to an increase in information. Indeed, reducing the number of legs may alter the body plan, but it does not explain the origin of legs in the first place. Nor does it explain where the genetic information to produce wings came from. Yet, later on in the same chapter of his book, he explained how he believed it evolved anyway and that the ‘absurdity’ was illusory. Had Darwin had the knowledge about the eye and its associated systems that man has today (which is a great deal more than what it was in his time), he may have given up his naturalistic theory on the origin of living things. One fascinating discovery in the study of modern ophthalmology (eye science) is that, aside from what Darwin was able to observe, there are three almost imperceptibly tiny eye movements. These three, referred to as ‘tremors, drifts and saccades’, are caused by minute contractions in the six muscles attached to the outside of each of your eyes. Every fraction of a second they very slightly shift the position of your eyeball, automatically, without conscious effort on your part, making sight as you know it possible. Tremors — the tiniest and probably the most intriguing of these movements, continuously and rapidly wobble your eyeball about its center in a circular fashion. They cause the cornea and retina (front and back) of your eyes to move in circles with incredibly minute diameters of approximately 1/1000 (.001) of a millimeter, or .00004 inch. OOOOOOOOOOOOOOOOOOOOOOOOOOOOOOOOOOO) touching and placed in a row straight across the thickness of the paper. If you can do that, you will have a feel for the minuscule nature of the tremors along with some appreciation for the Creator who has demonstrated His capacity for designing such a thing. An even more amazing characteristic of tremors is that the seemingly tireless muscles that produce them wobble your eye 30 to 70 times each second. If sound were involved, that would be fast enough to produce a low-pitched hum. Amazingly, on average, each of your eyes completes one million of these tiny circular motions in 5 1/2 hours. The number of tremors taking place in a lifetime is astronomical. Even though tremors are not large enough to be visible without great magnification, you could not see properly without them. For example, consider what would happen if these and all other eye movements stopped while you were staring at someone’s face. The light-sensing cells in your retina would quickly ‘stabilize’, and cease to send updated information to your brain, causing the image you perceive to fade into a uniform gray within seconds. If the person you were staring at smiled, their mouth, and only their mouth, would momentarily reappear out of a visual field of nothingness! The reappearance of only part of the face would happen because only the mouth moved, causing a momentary change in that part of the picture which the retina was seeing at the time. Thus, continued change in the light projected on each retinal cell in your eyes is crucial for constant vision. Hence the need for tremors that God has made to supply the retina with a slightly shifting picture many times each second. Without the tremors, which are probably the most critical muscular phenomenon for normal vision, you would have to be constantly looking about or continuously altering the light on a subject to see anything for longer than a few seconds at a time. During drift movements, the eye drifts relatively slowly and smoothly off the target where you are looking until it reaches an angle equal to about 12 times the size of a tremor. At this time the eye automatically jerks, via a ‘saccade’, back to its original position. Saccades, which happen up to several times a second, are very quick, jerk-type movements that are used to correct for whatever drifts are occurring. An interesting way to observe the effect that drifts, along with associated saccades, have on your visual system is to carefully study the type of graphic shown here. This experiment will show you that your eyes are indeed moving all the time, even when you think that they are not. Look intently at the center of this graphic. You should see a slight ‘shimmering, psychedelic effect’ that seems to jump about no matter how hard you work at holding your eyes still. This phenomenon can be enhanced if, while you stare at the figure, you stand at arm’s length, then twist or turn your body. Each time a random drift or small saccade takes place, the new picture your retina sees appears to interplay or interfere with a lingering ‘after image’ of what was seen a fraction of a second earlier. That is what causes the appearance of a shifting motion within the graphic. In this experiment, the tremors are too small and too fast to have a noticeable effect. Large saccades are employed in scanning motions like reading. As you read this article, you may think your vision is smoothly scanning, letter by letter, or word by word, but this is not so. Instead, the precise alignment of your two eyes is synchronously hopping along, via those ‘jerk-back’ saccades, following each line. During the moment a saccade is occurring, your vision is blurred, so between the hops are momentary stops which give the eye-brain system time to decipher the printed letters into meaningful phrases. Think of how challenging it would be for a human to create the genetic code needed to produce the fine-tuned nervous system that makes precise, coordinated muscular movements (like tremors, drifts and saccades) possible. When Darwin made his assumptions about the origin of organs, he had nothing like the knowledge we have today. Had he been aware of the need for the tiny precision humming. Hopping eyeball motions that are going on all the time while we are awake, he may have abandoned his theory of evolution as foolish and impracticable speculation. There is indeed abundant evidence of the Creator’s handiwork in all we see around us, and what we see with. Darwin, Charles. The Origin of Species, J.M. Dent & Sons Ltd, London, 1971, p. 167. David S. Falk, Dieter R. Brill and David G. Stork, Seeing The Light: Optics in Nature, Photography, ColourVision, and Holography, Harper & Row Publishers Inc., New York, 1986, pp. 192-193; Arthur S. Freese, The Miracle of Vision, Harper & Row Publishers Inc., New York, 1977, pp. 46-49; Tom N. Cornsweet, Visual Perception, Academic Press, New York, 1970, pp. 399-404. Tom Wagner is a science teacher in Indiana, USA. He is a keen photographer, whose articles and photographs appear frequently in Creation magazine. A fascinating discovery since Darwin’s time is three broad classes of almost imperceptible eye movements, drifts, tremors and saccades. To demonstrate that your eyes are always on the move, even when you think they are not, study the graphic located in the article above. An ‘afterimage’ is superimposed on the image you see, giving a twinkling effect that seems to be moving. Try keeping your eye steady: the twinkling effect continues. Creation magazine [CM]: Dr Marshall, you wrote to us to comment on the article “Seeing back to front” which appeared in the March–May 1996 issue of Creation magazine. What was your comment? Dr George Marshall [GM]: I pointed out that the principal reason as to why the eye cannot be regarded as being wired backward (as some evolutionists claim) was hidden in a footnote in your article. CM: Would you care to elaborate? GM: The light-detecting structures within photoreceptor cells are located in the stack of discs. These discs are being continually replaced by the formation of new ones at the cell body end of the stack, thereby pushing older discs down the stack. Those discs at the other end of the stack are ‘swallowed’ by a single layer of retinal pigment epithelial (RPE) cells. RPE cells are highly active, and for this they need a very large blood supply—the choroid. Unlike the retina, which is virtually transparent, the choroid is virtually opaque, because of the vast numbers of red blood cells within it. For the retina to be wired the way that Professor Richard Dawkins suggested, would require the choroid to come between the photoreceptor cells and the light, for RPE cells must be kept in intimate contact with both the choroid and photoreceptor to perform their job. Anybody who has had the misfortune of a hemorrhage in front of the retina will testify as to how well red blood cells block out the light. Then what do you think of the idea that the eye is wired backward? The notion that the eye was wired backward occurred to me as a 13-year-old when studying eye anatomy in a school science class. It took me two years of lecturing on human eye anatomy to realize why the eye is wired the way it is. The idea that the eye is wired backward comes from a lack of knowledge of eye function and anatomy. How do you react to the notion that the human eye is the product of evolution? The more I study the human eye, the harder it is to believe that it evolved. Most people see the miracle of sight. I see a miracle of complexity on viewing things at 100,000 times magnification. It is the perfection of this complexity that causes me to baulk at evolutionary theory. Can you give our readers some idea of just how complex the eye is? The retina is probably the most complicated tissue in the whole body. Millions of nerve cells interconnect in a fantastic number of ways to form a miniature ‘brain’. Much of what the photoreceptors ‘see’ is interpreted and processed by the retina long before it enters the brain. A computer program has allegedly ‘imitated’ the evolution of an eye. Do you accept this? ‘Computer simulation of evolutionary processes such as that described have three important flaws. First, the findings imply that the development which is being measured over so many generations is independent of development of other structures which are necessary for function. Second, the changes observed from the simulation are dependent on the original data input which clearly is consequent to human design of the sequences/regions to be worked on and also the program(s) which are used for the simulation. These are not, therefore, random. The third aspect of all this is that there is translation error in such simulations involving computer hardware/software. This can take the form of electronic error in single bits which are coding for a particular digit. Over many loops in this performance, intrinsic error can be magnified considerably. Was the simulation repeated using different PCs etc.? One feels that these three arguments are essential to any computer simulation package of evolutionary processes. ‘My first point indicated that even if there is an eye, it will be useless unless the organism has the neural and/or the mental processes to utilize information perceived by the eye. How can a chance mutation provide this complexity in several different structures? The argument has usually been that there is a plausible intermediate series of eye-designs in living animals, e.g. 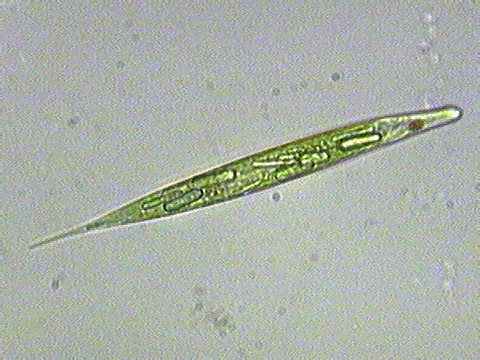 Euglena has an eyespot; other organisms have a “cup” which acts as a direction finder. What exactly does your work involve? Lecturing to doctors in medicine who have specialized in ophthalmology and are attempting to gain fellowship with the Royal College of Ophthalmology (FRCOphth). However, my main remit is research into eye diseases using a combination of transmission electron microscopy and immunocytochemistry—a technique that uses antibodies to locate specific proteins such as enzymes. Can bang goes the theory make a programme that looks at creation/ flood science ? Martin, you make my brain cry: so close to understanding, yet so far off. I’m sorry my argument is not more constructive but I despair; when reason and evidence fail to work there’s not much that can be done to convince those who put their faith in old, but ultimately fictitious, literature. Too long, didn’t read. Brevity, bro. I think you pretty much nailed it in the first sentence. The reason these things become possible with millions of years is because big changes are simply a whole bunch of small changes strung together. This should be obvious, you can cut any big change down into a whole bunch of tiny steps. We have observed the tiny steps. With millions of years, those tiny steps will obviously accumulate to create…yes, you guessed it, big steps. And massive amounts of data show links within species consistent with those smalls steps accumulating over time. We do observe evolution today. Insects are becoming resistant to DDT and bacterias are mutating to become resistant to antibiotics. You’re going to claim that is just a small change but that is all evolution is. Small changes, one after the other, over long time spans. This line you draw between small changes (which you admit happen) and big changes (which you deny) is an artificial one. There is no such difference within the field of biology, they are identical processes. Yes my reply was too long.To say I’m no expert doesn’t mean I am stupid. Also to have a long reply or have things pasted from elsewhere doesn’t mean it was wrong. Matt- the Bible is not fictitious. The bible contains a large amount of information that is historical. Jesus was an historical person. Places mentioned in the Newt testament have been found. Prophecies in the Old testament came true- especially about Jesus, his birth and death. It is true in my experience as I said- I was not a person easy to deceive- I did not know any Christians- but become one when God the Holy spirit convicted me of being a sinner and showed me His love and forgiveness. Like 100’s of millions of Christians in the world today I am not making that up. Gareth in principle small changes can lead to big changes- especially when a human being is adding a huge amount of information to change a red font to a blue one through a computer programme. That is the point – you need a huge amount of new genetic information to make new working organs and systems, especially to cross the huge divides between reptiles, mammals and birds. Mutations usually cause a loss of genetic information- nothing new is added. Natural selection brings the strong or fittest to survive (or those selected by humans) such as white bears being being suited to life in the Arctic. But there is no evidence in the fossil record of further changes between animals. You would need millions of further fossils showing evidence of changes. Whole systems must be working as a whole for them to work eg birds with feathers. When you say insects are becoming resistant to DDT. Researchers saw how roundworms rapidly became resistant to pesticide because the genes were already existent in the population but at a low level. This is not a production of any new genetic information rather an amplification of what was existing already. Mutations occurred in rats in the late 1950s to make them resistant to warfarin. This came at a fitness cost, such rats have a higher than normal requirement for vitamen K (10 times). This means they are prone to blood clotting disorders, many die from internal bleeding. When the rodenticide was no longer used their numbers declined. This is the principle pest management programmes use today, rotation. Farmers use certain pesticides to affect different modes of action- respiration, nerve transmission etc. When the population becomes resistant they switch to other pesticides and so on. When a pesticide is removed from a resistant population the creature is weakened by the damage caused by mutations. If insects become resistant to several pesticides, then by removing the pesticides the resistant insects die out (because they have been weakened by mutation) and the normal non resistant population grows again and normal pesticides can be used again. Sorry to debate so long- but the issues need time to explain. I found another quite from the answers in genesis site. [Summary quoted directly from the actual paper] Resistance to antibiotics and other antimicrobials is often claimed to be a clear demonstration of “evolution in a Petri dish.” However, analysis of the genetic events causing this resistance reveals that they are not consistent with the genetic events necessary for evolution (defined as common “descent with modification”). Rather, resistance resulting from horizontal gene transfer merely provides a mechanism for transferring pre-existing resistance genes. Horizontal transfer does not provide a mechanism for the origin of those genes. Spontaneous mutation does provide a potential genetic mechanism for the origin of these genes, but such an origin has never been demonstrated. Instead, all known examples of antibiotic resistance via mutation are inconsistent with the genetic requirements of evolution. These mutations result in the loss of pre-existing cellular systems/activities, such as porins and other transport systems, regulatory systems, enzyme activity, and protein binding. Antibiotic resistance may also impart some decrease of “relative fitness” (severe in a few cases), although for many mutants this is compensated by reversion. The real biological cost, though, is loss of pre-existing systems and activities. Such losses are never compensated, unless resistance is lost, and cannot validly be offered as examples of true evolutionary change. Don’t let the bedbugs bite—or evolve. New studies of bedbug genes offer the latest supposed example of evolution in action. The Wall Street Journal reports that the “irritating pests . . . are quickly evolving to withstand the pesticides used to combat them.” Alarmingly, the creatures are now able to survive pesticide applications a thousand times greater than what was lethal just a decade ago. In New York City, bedbugs have become an estimated 250 times more resistant to typical pesticides than are bedbugs in Florida. University of Sheffield bedbug expert Michael Siva-Jothy claims the resistance “has evolved very recently,” while University of Massachusetts toxicologist John Clark argues that “insect resistance is nothing more than sped-up evolution.” But is it so? One study, conducted by Ohio State University entomologists, focused on the biological process by which bedbugs turn toxic pesticides into harmless substances. Bedbugs exposed to pesticides show substantial genetic “activity” among genes that control the enzymes that catalyze the reactions that break down the pesticides. Another study, conducted at Virginia Tech, showed that genetic changes over time may be increasing the width of the bedbug exoskeleton, helping the bugs keep pesticides out. But are these changes actually “evolution”? As in the oft-misrepresented case of microbial resistance to antibiotics, a bait and switch (perhaps inadvertent) takes place: evolution subtly goes from being a synonym for “change” to being a synonym for “progress.” The change in how susceptible bedbugs are to pesticides can be explained entirely as a consequence of selection effects. Starting with an initial bedbug population of high genetic diversity, including some bedbugs with the “right” enzymic processes and others with thicker exoskeletons, treatments of pesticide will decrease the life expectancy and ability to reproduce of those bedbugs that lack the right enzymic processes or thicker exoskeletons. Over time, the bedbug population as a whole develops greater resistance to pesticide simply because the bedbugs that survive are all descendants of those that already had greater resistance. * Mutations may also be involved, but the resistance can be explained by mutations that distort or reduce the bedbugs’ genetic information, rather than mutations that add new information (which have never been observed). Yes, bedbug populations are changing, apparently in response to increased use of pesticides as they spread. But this change doesn’t provide evidence for progressive genetic changes that lead to new, more sophisticated life-forms. *It may also be, as we discussed earlier this month on “persistence,” that some of the increased bedbug resistance is another example of a non-genetic biological response to environmental changes. But this response is programmed by already-existing genetic information. As for the bible not being fictitious, I’m afraid you need to do more research. There are many complete fabrications in the Bible and the prophecies of Jesus only came true because the story was altered after the fact to make his life fulfill old stories. For example, the Roman census was completely fictional, but necessary to move Jesus birth to Bethlehem so he could confirm the prophecy of being descended from King David. Why aren’t we seeing rapid evolution today? Well, in some organisms we are, but in many we are not, because the need is not there. At some point, organisms slow evolutionary processes. Natural selection producing evolutionary changes is also more likely in smaller population sizes. Environments can change for any number of reasons. When large segments of an organism’s population are wiped out, the remaining organisms possessing the ability to survive those environmental changes are more likely to produce offspring with the same survival ability. We see this occurring with antibiotic-resistant bacteria all the time. mutations destroy information. That is not what creationists believe. First, we recognize that some mutations are beneficial. Second, we recognize that mutations don’t always delete information, but sometimes change it. Third, mutations and changes within a kind are not evolution. 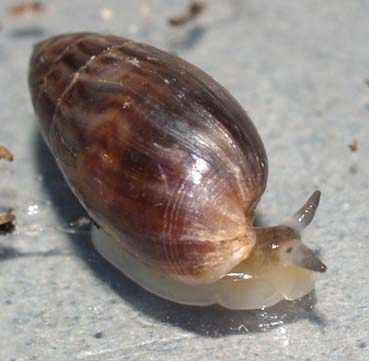 The shellfish example is insufficient because it is simply a new species of shellfish. It is still a shellfish, not something else, so it is within the created boundaries established by God. “gain” of information? Is there evidence on the molecular level to contradict the claim that this is from a loss of ability to switch off the enzyme lactase? Or evidence to support the claim that the mutation was in fact random? Where is the molecular evidence that the switch in sea squirts is from “new information”? I notice you don’t provide references with the actual journal articles like the creationists so often do. To the evolutionists, duplications must be chance events. I’ve seen enough in the literature to make me question that assumption. Also, in hox genes the duplications are not observed but inferred because of the atheistic assumptions of the evolutionary paradigm. Human creators often reuse design elements, but you have eliminated that possibility by assuming there is no Creator, hardly a scientific assumption. I agree that mutations can cause speciation, but then if you read the literature of young earth creationists you’ll find they have been saying this for some time. In fact genetic changes (which I suspect are often not random) help explain why the original kinds in Genesis are now often represent by families of organisms today. Finally, reversions do not explain the origin of the information. Cute manipulation of words, but no substance to demonstrate new information arising from random processes. Neither do mutations which demonstrate a change of substrate (for an enzyme)or ligand (for a receptor) explain the origin of genes which code for enzymes or receptors. Again, there is the possibility (although it doesn’t agree with evolutionary assumptions) that many of your cited examples are changes from complex programming placed in DNA by the Ultimate Programmer. As for the Roman census being fictional. Sir William Ramsey has made an exhaustive study of this- look him up. The new Bible dictionary states that there is evidence of census activity in various parts of the Roman empire between 11 and 8 BC and a census in egypt in 10-9 BC (held every 14 years) is especially persuasive. There is an attested census in Egypt 104AD. The new bible dictionary discusses Quirinius census. What is a fact is that he was a real person- 3bc he was proconsul of Asia. In Acts 5: 37 there was a census in Judaea recorded by Josephus (Ant. 18.1-3,26). Sorry I have not read fully your last link- i will try- but finding problems with a city like AI does not disprove the whole of the bible- it just means we do not have enough evidence today to prove everything in the bible. But you are ignoring the host of other places that were around and we do have evidence for. t’s even worse than this. Recently historians have found out that the common idea of slaves building the pyramids is incorrect. Paid labourers built the pyramids. Ie, no enslaved Jews for Moses to lead out of Egypt. Also, there is no evidence for any large number of Jews in Egypt at the time. They kept decent records, there are records of a large Jewish population in Egypt, but 1000 years later than the period described in the bible. These three facts, that the Egyptians didn’t use slaves to build the pyramids, that there isn’t evidence of any Jews in Egypt at the time and that there isn’t a shred of evidence for any mass exodus or slave escape, combine to indicate that the story of Moses is completely fictional. Firstly- i don’t think the Israelites built the pyramids, the bible I think mentions building cities. If they did build the pyramids- then how would you or I know- there are millions of things that happened in the past we don’t know about. You are wrong to deny the historicity of the bible. Brian Edward in his book nothing but the truth p. 396 mentions later biblical historical where we do have direct evidence in archaeology. There was no census, in fact the idea of the Roman Empire conducting a census by telling all it’s citizens to go back to the cities of their birth is utter madness, think about it! Imagine all the peasants and so on uprooting themselves and travelling to major cities, the looting and confusion! You’d do it the way you’d do tax collecting, by sending dudes out to the cities and villages, not by recalling everyone from the countryside! The sheer logistics of the thing would be impossible to co-oordinate. Yet Brian Edwards book ‘nothing but the truth, states on p.402 that in the british museum is the census order by prefect Gaius maximus in Egypt for everyone to return to their birthplace for registration in 104 AD. So it happened in Egypt and people would have had to walk a long way. I think this proves that it was possible. You are just mocking and saying how silly. The jews were used to going up to Jerusalem every year for their annual festivals. In Jesus life he travelled as boy to Jerusalem ! Paul travelled across the roman world- it took time- but was possible. The Roman empire enabled travel, communication and commerce-. How about god made evolution as a coping mechanism when he created the world, easy way to explain why evolution exist and those who believe in the sky wizard can still believe in their sky wizard. Debating about if you use a baseball in a baseball game, regardless of the end result of the debate does not change the fact that they use a baseball in the game same here. Evolution is a fact, some people like to call it theory but are quickly reminded that gravity is a theory too, so is magnetism and relativity (btw, our satelites and gps systems work on the theory of relativity) but I don’t see as many people questioning them. Even the Catholic churh known for the fact that they accept evolution. For ex. making a house in one step is impossible, just like one animal evolving to another in one step. I hope everyone here understands that to a creationist its really hard to depart from the things he knows and admit that he might be wrong. Of course the BBC miss the context that the quote stated is in the chapter on problems with his theory. If Darwin were alive now I think he’d be mortified that his theory has been turned into a religion. If you look into it you’ll find that the eye is supposed to have evolved several times. For this and many other reasons any decent mathematician would have to denounce evolutionary theory as highly unlikely. @ Martin Scrase: in your first post you said “mr darwkins”, that’s a different guy 🙂 we’re debating Darwin. And your posts are too long. Dr Lee Spetner in his book “Not by chance” points out that much Darwinian theorising is based on verbalising without producing genuine evidence. A good example is claiming a human eye might have evolved by discussing primitive photo-receptors or mullusc eyes or the octupus eye which is close to the human eye. The error here is the these are all from species other than mammals. The reasoning is specious and misleading. This kind of argument is also linear and not comprehensive. By that I mean that Darwin and his famous disciple Richard Dawkins restrict the discussion to the evolution one organ of the body but one has to ask how all the other organs were evolving? They never address that problem. The human body is a superb example of irreducible complexity writ large. Blood depends on bone marrow and vice versa and what has been called “evolution’s awkward secret” is rarely if ever discussed, i.e. how did we come by our reproductive apparatus which, must have the apparatus in both genders in working order, e.g. a low sperm count or blocked fallopian tubes will prevent conception. How did all that come about by the small gradations Darwinian evolution demands? As Dr James Le Fanu explains in his book “Why Us?” evolutionists need to look for a far better theory than Neo-Darwinism. To start with they must explain how the Cambrian explosion resulted in the appearance of a myriad new body-plans observed in the Cambrian explosion. Saltations/punctuated equkoibrium have been proposed but are flatly denied by Dawkins who has nothing to offer by way of explanation. Almost everything that mammals have is fro species other than mammals. Mr. Hudsmith’s failure to understand that mammals came along late and inherited a huge genome is breathtaking in its ignorance. Love this debate! Is it still on? Hi Radu, thanks for your comment! It’s never really over. Sometimes it will die down, but someone who feels strongly in either direction will inevitably find the post and spark it up again. It’s great entertainment! From what I can see, this has turned into an argument against religion and more specifically against Christianism and the Bible. Could anyone agree that the Theory of Evolution is exactly that: “a theory” while the Christianism is, well… a faith. The Bible might have some historical value but ultimately it conveys a message of salvation for its believers and it no circumstances should be treated as a scientific resource. Saying that, we are all curious beings and inspite of our beliefs (in a certain god or a certain theory which is yet to be proven true), we are all born with an innate spirit of “boldly going where no one has ever been before”. The quest to establish our own origin and meaning has always been and probably always be a hot issue. I have to say that I am a believer, not in the theory of evolution unfortunately but in eternal salvation by the acceptance of the ultimate sacrifice of Jesus Christ, and with that I’m not going to say anything “religious” anymore. The origin of life and of “us” has made me follow similar blogs and tv shows for quite a while. I do have a problem however. If, and I can’t desagree with that, we are the product of micro and macro evolution, then what was before that “something” which then evolved into a further “something else” etc? The first microorganism, in it’s simplest form, was nothing short of a very complex bundle of organic and inorganic chemicals which scientists can just about attempt to recreate. Some forms of simple unicellular “artificial organisms” have been actually created but they are actually just patched up, already living organism. So the issue is not the complexity, as perhaps one day we will come to a stage when we will create an actual organism. The problem the scientific community will have then is to “kick” it into “being”: that is, to make it live and reproduce. And we haven’t even touched the unique properties of some organisms to express a spiritual being through art, music and even scientific research, an aspect which involve an awful lot of …imagination, features typical of “humans”.